Get off the 7 train at 46th Street, otherwise known as "Bliss Street." The alluring name is a throwback to Neziah Bliss, the neighborhood's major landowner in the 1830s and 1840s. When you exit the station, you'll be greeted by a cheerful Art Deco style arch. It may be a bit outdated (and, some would say, tacky), but what other neighborhood offers such a warm welcome? To keep the old-school vibe going, start your day with a coffee and eggs or a doughnut at the counter of Alpha Donuts on Queens Boulevard and 46th Street. This diner looks and feels like it hasn't changed at all since the 1970s—and it probably hasn't. You can even sit and listen to some old timers tell stories about the neighborhood in their thick Queens accents. After your classic breakfast, walk two blocks west to 44th Street, where the big discount store South Pole awaits. It's always a surprise to see what crap and treasures you can find here. They carry everything from office supplies to clothing to furniture to off-brand drugs. Quirkier finds might include fake dishes of food from restaurant displays and original Teenage Mutant Ninja Turtles party favors. When you're ready for lunch or dinner, head a few blocks south to De Mole on the corner of 48th Avenue and 45th Street. You'll get authentic, fresh, and delicious Mexican food with fantastic service and impressively low prices. Special treats include the spicy hot chocolate, squash blossom quesadillas, and fresh fruit licuados (like a cross between milkshakes and smoothies). 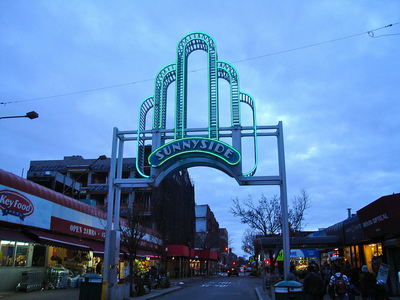 Once you've had your fill of the south side of Sunnyside, cross over Queens Boulevard to explore the fancier north side of the neighborhood. You can wander tree-lined blocks, admiring the quaint row houses and well-kept gardens of this historic area. Keep your eye out for the secret walkways that cross through some of the blocks. On Saturdays from June to December, the Greenmarket is set up on Skillman Avenue between 42nd and 43rd Streets. If you are in the mood to browse antiques and artsy goods, head to Skillman Avenue and 49th Street for two cute vintage shops. La Belle D'Epoque is a classic antique shop with a large selection of furniture, clothing, and housewares. Across the street, Stray Vintage and More has a delightful selection of vintage wares and products made by local artists. You're bound to find the perfect gift or something to spice up your apartment. Before you head home, stop for a drink at one of the neighborhood's laid back establishments. For coffee in a friendly new cultural hub, try Cafe Marlene on 49th Street and Skillman Avenue. If you're a wine lover, head to Claret on Skillman Avenue and 46th Street for great selection and pleasant atmosphere. Or if you just want a beer or two, take your pick from any number of laid back Irish bars on Queens Boulevard: the Gaslight, the Courtyard Bar, or the newest addition, Molly Blooms. All of them have patios open in the back during warmer weather. Back up on the train platform, you'll end your day knowing that it is possible to find peace and quiet within city limits—even within plain view of the Empire State Building. Why? You deserve a peaceful day in the city. Hey Joanna! This is a great itinerary! Queens is such a great area and extremely diverse. My family is obsessed with the Thai restaurant in Woodside called Sripraphai. This of course is a great compliment since we are extremely picky about the Thai food we eat outside our house. Molly Blooms sounds fun! I'll have to check it out!